The world is replete with amazing programmes that make life for numpties like me much easier. Graphing tools are something I particularly like. As someone who has to work on a range of different operating systems, cross-platform graphing tools are in their own little world of awesome. This is a quick post about one of those: gnuplot. I actually don’t use gnuplot that much. Most of the time, I either have to work in Excel because of clients*, or I do plotting within statistical analysis programmes like Stata or R. However, sometimes it’s just nice to use something that works elegantly and that easily handles data piped to it from other code. 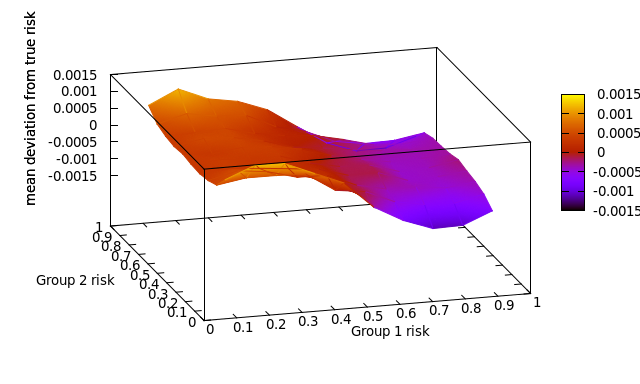 The example we’ll be using here is a neatly coloured surface plot that I produced for a paper recently. Surface plots are shiny and lush, but can be a right pain to actually produce. Yup, that’s still it. It’s sooo nice to have something that just uses normal code. If you’re using a data file, just make sure it’s in the working folder. 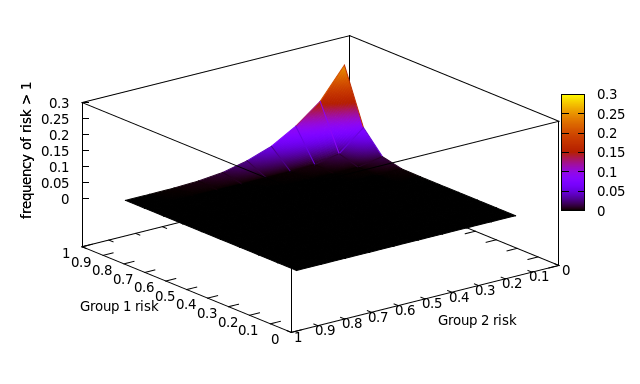 set xlabel "Group 1 risk"
set ylabel "Group 2 risk"
Then, I offset the y-tick labels using a simple vector. In practice, you can only really do this after an initial plot. Just play with it. Then, I tell the programme to treat my data as grid information. Basically, this is just warning the computer that I have a 3d scatterplot. I could specify how many x- and y-values I have, but there’s no need with this data set. Once you’ve plotted it, you can rotate the image and play with it before outputting it as an image. If you want to delve into this a bit more, this page from Henri Gavin gives a really neat, short intro to lots of topics. This site gives detailed examples of plots and is a great place to get ideas for new and interesting ways of plotting your data. * Do yourself a favour. Avoid using Excel for any serious analysis. Spreadsheets are great, but they are not suitable for proper modelling or statistical analysis. It’s a personal opinion, but I think the obsessive use of Excel has actually prevented health economic models from being transparent. ‹ Big Data, Big Knowledge: marketing hype or the future of human understanding?